This is for you. I have been in your shoes, and I have some observations to share. You did everything you were supposed to do. You bought those stupid extra long sheets and brand new matching towels and facecloths. You naively packed a broom and a little vaccuum, along with a supply of vitamins, ibuprofin and Tums. Maybe you opened up a student checking account. You put some equity onto one of those swipe cards so your child can buy a sandwich, some coffee, toothpaste. You packed up the van and took the long drive, placed your temporary parking pass in your windshield and dragged 24 boxes of “essentials” up the three floors to the dorm room. You met the roomates and their parents, helped your child to put some things in the tiny crevasse that passes for a “closet”, and then stood there awkwardly for a few minutes. Now its time to go. Its time to put your arms around your baby, kiss her cheek and tell her that you are proud of her. Tell her to have fun, then indulge yourself in one more “be careful!” before you square your shoulders and walk out of that room. Well meaning friends will tell you that you should feel proud right now. Reassure them that you are. They will tell you that this is the way life is supposed to go. “Kids have to grow up!”, they will say, “Its a vital step!” Nod your head and agree with them. You know this already! Family members will attempt to make you feel better by saying, “Oh, don’t worry!!! Hahaha! They always come back!” Just smile. Look grateful. Then get into your car, put her head on your arms and let yourself grieve. Tell yourself what you know and must sadly accept. You are saying goodbye to the baby that you raised. You are leaving those Mommy times behind you forever. Your little one has done what little ones inevitably do; she has grown up. You can’t stop that, and you can’t pretend that it isn’t a loss. Give yourself time to curl up under a blanket and just cry. Cry for the first days of school and the birthday parties and the goldfish crackers and the tiny socks in the hamper. Cry for the warm little hand resting on your cheek and for the feel of your palm on a fevered brow. Cry for the good night kisses and the cuddles and the need for you when a nightmare strikes. Give in to the need to look away when toddlers and their mommies walk past. Its OK. Allow yourself to skip the baby aisle at the grocery store for now, knowing that the smell of powder will make you weepy. Turn your head when baby commercials come on TV. Hug the dog, and talk to her as if she’s a child. Cry when you wake up in the night because you think you hear your child calling you. Cry when you wake up in the night because it is too quiet now. You did everything you had to do. You were brave and unselfish and you let your child go. Now grieve for awhile, and admit that life will never be the same. Then slowly, slowly lift your head and look to the future. Look to your new life, and your new adventures. Look ahead and see how sweet it will be to have this wonderful adult in your life, and how exciting it will be to watch her life unfold. Chin up, Susy! We love you! Oh, this will be me! I’m only ten years out rob graduating college though, so I feel like I’m smack in the middle. I remember not understanding at all what my parents were so up in arms over, yet here I am with my the babies, knowing that the same thing will happen to me in a few years. Ack. What makes growth and change so bittersweet? I loved this post. I still get weepy in the fall, thinking of all those kids moving out…And you know what? My daughter and her fiance are in the process of moving in here TODAY. The circle of life, huh? Seems like only yesterday I dropped Kayla off at UMD for her freshman year. But it is five years later. She graduated college over a year ago and has been living on her own half way around the world for the past year. 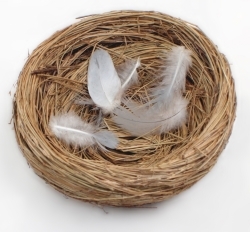 I have learned to live in this empty nest and have even learned to really enjoy it! I know; it just flies by. But when people are in the middle of that process, its so incredibly hard. I think that we don’t recognize the intense sadness that goes with the process. We sort of just say, “This is a good thing!” and we act like those parents who are really sad are somehow just looking at it the wrong way. Hope that all is well with you and the girls!!! Halfway around the world WHERE? This is beautiful, thank you. That was me last year, and now I have a small reprieve because my daughter graduated in June and is back with us for awhile. Just . . . thank you. I heard a talk show the other day where callers were basically bashing the host because he is very sad to be sending his oldest off to college. They acted as if his grief was because he didn’t want his children to succeed. I just wish that our society had some sort of ritual for helping parents to accept and acknowledge the grief that goes with this rite of passage. Enjoy your time with your girl. It is a special gift to have the chance to know each other as adults! You just described my life as of now. You put into words everything I’ve wanted to say…. Thanks for helping me with this ‘change’ this next page in the story of my life! Good luck, and take good care of yourself! It does get better, and that calm and organized house does begin to have its own special treasures! I wish that we allowed people to feel this grief…..
My life this weekend! My second, my only son is on his way this Sunday. it hasn’t hit me yet. Oh, my! Good luck, and be strong, and definitely let yourself grieve. You have so clearly described the the feeling at the college dorm drop and the immediate aftermath….sad, a bit lonely and takes awhile to come to terms with. Good thing that parenting never ends! We just got back an hour ago from dropping off our youngest at his dorm 🙂 I thought it might be easier since we’d done it before, but not so much! Thanks for your wonderful words. It never gets easier….it just doesn’t…..